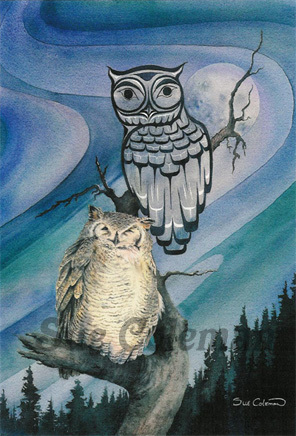 The Tsimshan believed that the owl was the shaman's helper and could cause death to the person it flew over. This seems to be a fairly common belief, as the Kwakuitl also say that a person will die if he hears the owl call his name. There is a legend describing the creation of the first land where mud was brought up from the bottom of the sea and spread onto the back of the Giant Turtle. When an earthquake occurs it is because Big Turtle gets tired and has to move his feet. Phone to be sure I am not away at a show.